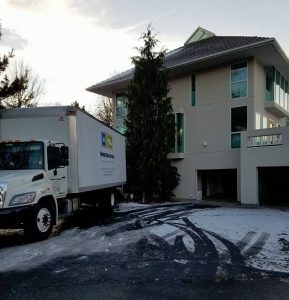 Winter moving tips are almost essential for any move. Whether you plan to DIY or are hiring experts, check out these 5 easy tips! Tip 1. Clearing and Prepping Space. During the winter season, preparation is especially important for safety and productivity! Ensure roadways and driveways are accessible – Remember a moving truck isn’t as nimble as a car or SUV! Tip 2. Storage Considerations. Plan your storage to accommodate the seasons. If you have items in storage that are sensitive to the cold (electronics, etc) it is important to have climate controlled storage. Tip 3. Packing Considerations Cold weather means we need to take some extra considerations during packing. Electronics are especially susceptible to damage! Brush up on our electronics packing tips here, or consult our experts. Tip 4. Protecting Your Home! Nasty weather means extra care is needed. During the planning process, make sure there is never a gap in your utilities! Cold temps can quickly mean burst pipes and other damage. Make sure your heat and water is taken into consideration. 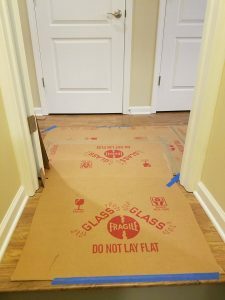 We also take extra precautions to protect your floors. Salt and moisture can wreak havoc on any floor. Using floor protectant is essential! Tip 5 Keeping Warm, Dry and Hydrated. Layer, layer, layer! Even if you have hired help, moving indoors and out repeatedly can require easy layers. Keep extra shoes and socks on hand too! If you are planning a DIY move, make sure you have proper footwear, clothing, and gloves. Lastly, It’s incredibly important to stay hydrated in the colder temperatures. While we may get hot and crave water in the warmer months, it doesn’t mean your body doesn’t need it in winter! Proper hydration is essential to warmth. One last bonus tip: Check the weather OFTEN! Having the proper information is incredibly important. Always plan extra time during a winter move for unexpected delays.